If you happen to walk past the quiet Convent Avenue at the intersection with 131st Street on certain afternoons, you may hear, through the thick walls of a building that once used to be a convent, the unmistakable sound of an orchestra at work. 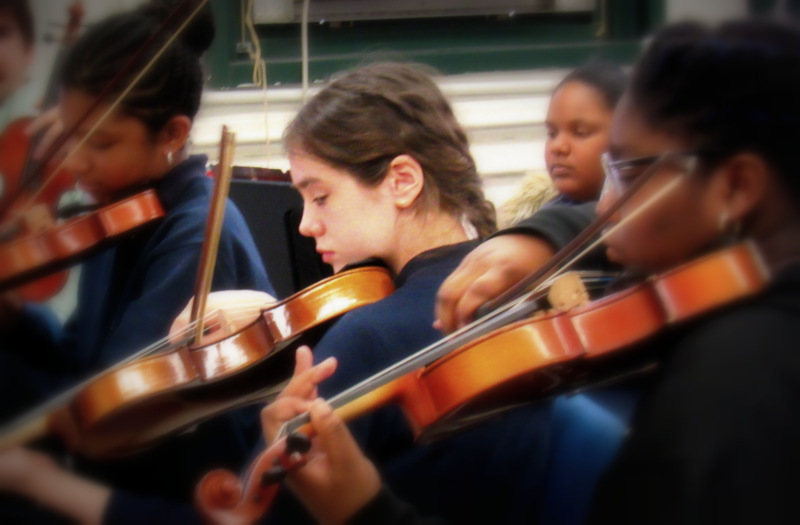 It is the sound of the Mott Hall School orchestra. But don’t let the thickness of those walls fool you. The Mott Hall, a public middle school located at the heart of West Harlem, adjacent to the City College campus, has a strong bond with the community it belongs to and fosters community partnerships as a way to enrich the education of its student body. “This is a school without walls,” stresses Judith De Los Santos-Peña, the school principal since 2015. Since 1985, the Mott Hall has been providing rigorous instruction to high-achieving students, mostly from Harlem and Northern Manhattan. Admission to the school is competitive and it includes an exam and an interview. Even though the school is famed for its focus on STEM (Science, Technology, Engineering, Mathematics), De Los Santos-Peña is committed to making the arts a key element of the school curriculum. “The children see themselves as mathematicians and scientists. We want them to also see themselves as artists,” said De Los Santos-Peña, noting that The Mott Hall is transitioning from STEM to STEAM school, the initial for “Art” added to the acronym. She firmly believes that enrichment is done collectively and is only possible through partnerships with other organizations. One such organization, the Multicultural Music Group (MMG), is a not-for-profit that has been a partner to the Mott Hall School for almost fifteen years. The MMG is responsible for the music that fills in the school corridors and beyond, on Tuesday and Friday afternoons. Luis Mojica, the executive director of the MMG, founded the organization in 1996, as a response to the need of multicultural representation in school music programs. MMG seeks to connect the ethnical and culturally diverse students of New York City public schools with their musical and historical roots. The partnership between MMG and the Mott Hall is going well and growing. Today, the school band has 25 children, 5 woodwinds, 5 brass, 10 strings, and 5 percussions. For each group of instruments, there is an instructor that works closely with the players. Jim Piela, a saxophonist, is one of the instructors that twice a week helps the band members at the Mott Hall hone their music skills. Piela moved to New York to pursue a career as a jazz musician. Determination has paid off for the 32-year-old Wisconsin-native. Piela, besides working with the MMG, is a member of several jazz music groups, and plays a variety of rhythms, at venues all over his adoptive city. “I have been a professional musician for over a decade,” he says proudly. 28-year-old Timofei “Timo” Rosales is an alumnus of the MMG after-school program and a cello player. Through his mother, who is also a musician, he joined the group first as a high school student, and some years later as an instructor. Today, and for the past two years, Rosales is the director of the Mott Hall orchestra. He is elated at the children’s feedback. “Kids like the interactions with other students and making music together,” he says. Guided by a dedicated group of adult musicians, the true stars of the after-school Mott Hall orchestra are the kids in the band. Among them is Daniela Toribio, a 12-year-old, now in her second year as a member of the band. The 7th grader got her motivation to join the band from her father, an immigrant from the Dominican Republic, who plays percussion. Following on her father’s footsteps, she plays the congas with the band. And she loves every bit of it. Daniela says that music reflects one’s mood and recognizes that, in order to get the right sound, the artist needs to be inspired and full of positive energy. “If you feel like, I got this, it sounds good,” she says with a wide smile on her face. Aali Garcia, a 13-year-old, plays the alto saxophone in the band. A jazz lover, Aali says that the after-school music program granted her an opportunity that she had not had before. “And you get to choose your instrument,” she rejoices. The group of adults that works with these young musicians has nothing but words of praise toward the band members. Delca Ortiz, the coordinator of programs and bilingual guidance counselor at the Mott Hall, says that the children at the school in general, and the kids in the band in particular are truly special. “The children have enthusiasm for the arts like you don’t see in other places,” insists Ortiz, who has come out of retirement to join the Mott Hall in her current role. Instructor Piela couldn’t agree more. “They [the children] are extremely easy to work with. Hopefully, we are inspiring them to do their best and be curious about music,” he says. On March 27th, from 7 through 9 pm, the band will perform -free of charge- at Aaron Davis Hall, 115 Convent Avenue, in Harlem. The show, The Latin American Diaspora Experience, will showcase symphonic orchestrations related to the culture and people of the major Latino groups in the United States. For more information, go to multiculturalmusic.org.